President Trump on Wednesday unleashed fresh criticism of John McCain, attacking the late GOP senator from Arizona for his connection to a dossier of claims about the president and Russia, his vote against a Republican effort to repeal ObamaCare and his support for the Iraq War. Trump spent five full minutes jabbing at McCain during an official White House event intended to highlight manufacturing in Ohio. The barbs marked the fourth time in the last five days that Trump has criticized McCain, who died from brain cancer in August. "I gave him the kind of funeral that he wanted, which as president I had to approve. I don’t care about this, I didn't get a thank you. That's OK," Trump told workers at a tank factory in Lima, Ohio. The president stoked controversy in the days after McCain's death last year when he waited to lower flags to half-staff and offer an official statement. He later did not attend McCain’s funeral at the family’s request. The latest criticisms of McCain briefly turned Wednesday's official White House event into a de facto campaign rally, events in which the president regularly excoriates his critics and rehashes his administration's accomplishments. During the event Wednesday afternoon, Trump read at least some of the remarks off a teleprompter. He elaborated on his reasons for his long-running disdain for the Arizona Republican, starting with McCain passing along to federal law enforcement a dossier of allegations about Trump's ties to Russia. "McCain didn’t get the job done for our great vets and the [Department of Veterans Affairs] VA," Trump said. "That’s why when I had my dispute with him I had such incredible support from the vets and on the military. "We’re in a war in the Middle East that McCain pushed so hard," he added, referring to the Iraq War. "Not my kind of guy," Trump said. "But some people like him and I think that’s great." 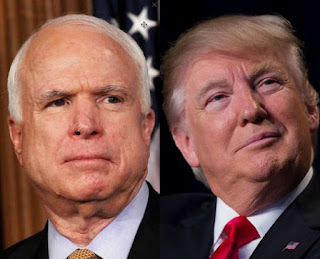 Trump has in recent days gone after McCain, specifically over the dossier about his alleged ties to Russia and the late senator's vote against the repeal of ObamaCare. A number of Republicans have condemned the president's attacks against their former colleague. Sen. Johnny Isakson (R-Ga.) on Wednesday said Trump's criticism of McCain was "deplorable" and showed a "lack of respect" for the Arizona Republican's military service. Others, including Senate Majority Leader Mitch McConnell (R-Ky.), have defended McCain without invoking the president's name or latest criticisms. McCain’s family and friends have more fiercely hit back against the president’s recent comments.